A species of moist ground, collected in 1919 near Fish Hawk Lake in Gogebic Co. by H. T. Darlington. A 1904 collection (H. S. Pepoon 226, MSC) from near Magician Lake, Cass or Van Buren Cos. appears to be the same, and O. 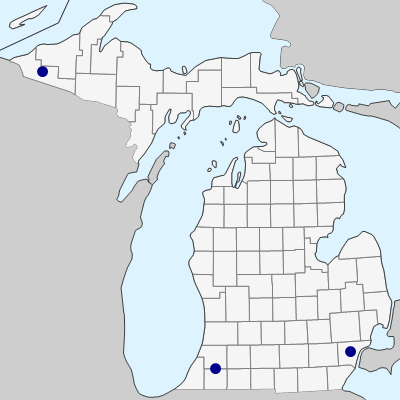 A. Farwell (8024, BLH, MSC) found the species in 1927 at Eloise (Wayne Co.). MICHIGAN FLORA ONLINE. A. A. Reznicek, E. G. Voss, & B. S. Walters. February 2011. University of Michigan. Web. April 21, 2019. https://michiganflora.net/species.aspx?id=1710.